Just wanted to wish my godmother (I call her "Kai Ma" in Cantonese) a very, very happy fiftieth birthday today on 10.10.10! She's one of the most generous, hospitable, encouraging, and kindest people I know, and I'm very thankful to have known her my whole life! Happy birthday, Kai Ma--so glad my mom and I could come all the way to Chicago to celebrate it with you! Love you always! 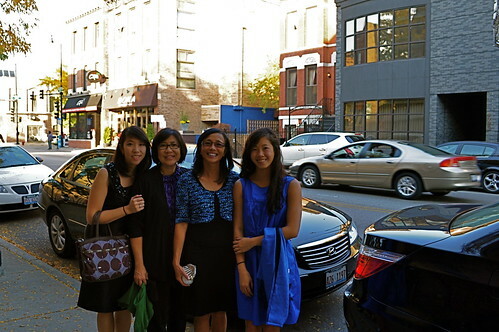 From left to right: me, my mom, Kai Ma, Laura (my godsister), and Kai Yeh (my godfather--the photographer here!) celebrating Kai Ma's 50th birthday at Grant Achatz's Alinea in the Lincoln Park neighborhood of Chicago! Blog post about this gastronomic adventure is on its way, I promise! 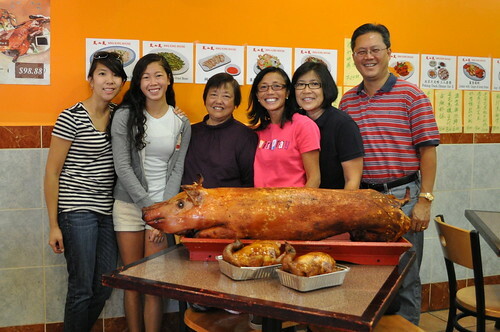 From left to right: me, Laura, Kai Ma's mom, Kai Ma, my mom, and Kai Yeh picking up the whole roast pig and soy sauce chickens from Chinatown's BBQ King House in Chicago earlier today for her big celebration tonight! From what I've tasted, both are very delicious! The Chinese believe that serving a whole roast pig is a good omen--the harmony of the "whole". Another good omen is to serve whole chickens, which symbolizes a proper beginning and end to the year as well as the wholeness of life on earth. Happy Birthday, Kai Ma :] excited to celebrate with you, your family, and your close friends tonight!